School’s out for Week 7, which means there are nine full days of quality family time ahead from Saturday 12 February. Nine whole days … but before you start panicking, assistance is at hand from our handy collection of selections. So before you charge up the iPad and let them vegetate the week away, remember there really is a wealth of opportunity out there: to learn, to create and to participate in with reckless abandon. So stop using the February winter cold as an excuse. Get them outdoors and explore what the city has to offer. Don’t miss ‘The Nightingale’, an operatic adaptation of Hans Christian Andersen’s fairy-tale about a Chinese emperor. As is tradition, the brewery’s stables will be open inviting visitors to access the behind-the-scenes of Carlsberg’s horses. There will be specialists to talk about the horses, and also activities related to them. As usual, a lot of fishy fun is going on at the Blue Planet, one of Copenhagen’s favorite family attractions. You can have numerous experiences at Northern Europe’s largest aquarium and even have a close encounter with sharks. Learn about and try out drawing, painting, sculpture and more. Visit their website to book a space on one of their workshops! Learn more about animal life on Earth. With a collection of more than 100 million specimens at the museum you can see the exhibitions of the skeletons of the mammoths and whales and learn more about wildlife. 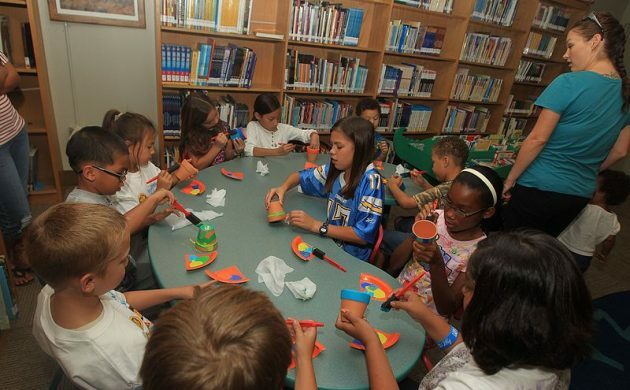 Express your artistic side at the museum through painting, sculpture, hat making and collage workshops. There will also be competitions and guided tours. They have limited space so hurry up! Famous ventriloquist Preben Palsgaard will make sure you laugh like never before with his show. Check the circus website for prices and dates for the show. Once again, during the winter holidays the ‘Build for Children’ workshop is coming back, this time with the theme “Future Sustainable Cities” where the children can participate in building future sustainable houses. Visit the website for more information about prices and dates. Visit the Queen’s Library at Christianborg Slot for theatre, workshops and guided tours. ‘Den Folkekære Konge’ tells the story of Frederik VII, a king who dreamed about being a normal kid. Kids can also visit the nearby royal stables. Get inspired by the oriental designs and shapes at the ‘Japanomania’ exhibition. Participate in workshops where where you can learn how to make kites, draw manga pictures and draw flowers in a Japanese style. Discover what it’s like to live in a polar climate, watch ice sculptures being carved and participate in workshops. Games, outdoor activities and workshops are expected during the winter holiday at the Roskilde Bibliotek. Check its website to see the complete calendar of activities. Østerbrohuset will be transformed into a colourful myriad of warriors, elves, orcs, Vikings, medieval folk and performers. Put on your Viking costume (for a 20kr discount on entry) and find out how their ships were made and what crafts were most important at the time. And then take your expertise to find a bargain at the market and check out the fight re-enactments. Grab your Mickey ears and get ready for the ultimate Disney experience when Disney on Ice – 100 years of Magic skates into Copenhagen. Be charmed by a cast of over 50 unforgettable Disney characters performing 14 classic stories in colourful costumes on a stunning set and sing along to all your favourite songs. Upbeat music, loveable characters and unforgettable moments make this an experience your family will cherish forever! Crazy about Lego? Then come and experience Lego World 2017, where fun and educational activities are awaiting your whole family. Or alternatively leave them to leg godt while you let go.